Last I touched upon some arguments about music theory. This week I will give you a quick primer of the blues harmonica music theory you need to know to become an even better player. As you will see it is not very complicated and the benefits are well worth it. The most common form of accompaniment you will come across when playing blues is the 12 bar blues. 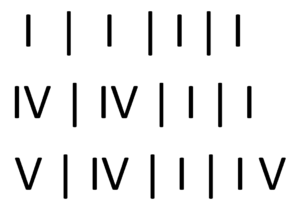 The picture shows the 12 bar blues outline with roman numerals and writing it like this means it can be used in any key. A chord is two or more tones played together taken from a scale and the chords in a major key are based on the tones of the major diatonic scale. A G-chord is made up of notes from the G-major scale, a C-chord is made up of notes from the C-major scale and a D-chord is made up of notes from the D-major scale. What is often referred to as a chord is the first, third and fifth note of the scale played together. Stacking every second not of the scale is usually how it’s done (we won’t dive super deep into this). There is one exception however and that is that the seventh note of the scale i flattened when it is included in a chord. This makes the chord sound more interesting. The notes on parenthesis are overblows and blow bends and if you do not master those techniques just ignore them. Note: The holes and tones in parentesis are often added to make the scale more flowing as the b3 and b5 are missing between holes 6 and 9. This adds a little extra bluesiness to this range. To make it a little bit more readable, here is the scale between holes 2 and 6. Blue notes are notes that create nice bluesy tension towards the chord. These are b3, b5 and b7. The blues scale contain these notes for the I-chord but also knowing them for the IV-chord and V-chord gives you nice option to play over those chords. Playing solos that completely stay within is absolutely fine but using chord tones and blue notes to follow the chords and mark chord changes for example can really create awesome solos. Especially how you handle to V-chord can set you apart from the rest of the pack. Here knowing the chord tones is cruical. When playing accompaniment playing you have a few options on what to play. However you chose to play it is your job to play something that is musically appropriate. You can for example play a bass line together with the bass player and then you will definately need to know where the chord tones are. Another option is to create tension against the chords and then you need to use blue notes and stay away from the chord tones. However you chose to play, know the theory will help you. I hope I have convinced you that learning blues harmonica music theory is a good thing and you want to make use of it. What you need to do now is take each of the concepts in this article, comit it to memory and start using it. The best way to do this is to concentrate on one single thing and have that as a focus when practicing playing solos for example. If you want to get to know the chord tones then play a lot of solos just using chord tones, when that starts becoming natural start using a few blue notes and so on. Before you know it this will become second nature. Should you want to learn more general music theory I can recommend “Music Theory for Dummies” as a good starting point or you can take music theory classes on Skillshare (take advantage of the Premium membership offer). If you enjoyed the article please like and share it! Music theory may not be at the top of your mind when you start playing blues harmonica. Some people even argue that knowing theory is bad. When I started playing I didn’t study any theory at all but during the last couple of years I have discovered the benefits. In this article I give you some counter arguments to arguments against knowing music theory. I have come across a few arguments against music theory for blues haromica players and I just want to make a few comments. The masters got by without knowing theory. Although it might be true that the masters of the early and mid 20th century were not classically trained in music theory, they certainly had a good intuitive grasp of it. They were learning from each other and other musicians and learned what sounded good. They learned it in practice. Most of us don’t spend as much time practicing and gigging as many of the early masters did. Learning theory is a way for us to leapfrog some of the trial and error. I just play by ear. Playing by ear is great and training your ears is a great thing. However theory will not hurt your by ear playing, it will just increase your understanding. I don’t want to know music theory. This argument I have the most difficulty understanding. I think it comes from a view that learning to play purely by ear is more noble and that music theory will hamper creativity. I would say that knowing theory increases creativity. You have to know the rules before you can break them with good effect. It will stop me from being creative. Actually I would say that knowing more allows you to be more creative. It allows you to utilize riffs and musical passages that you never would have thought of if the theoretical connections hadn’t been there. Understanding more of what you do is always a benefit in my opinion. More knowledge changes how we see things and we often end up enjoying it more. We also get a new vocabualry that we can use when communicating with other musicians. It is definately beneficial to be able to communicate with a musicians vocabulary in a open stage situation or if you gig with somebody you normally don’t play with. I don’t really see any cons with knowing a bit of theory. The only thing might be that when you pratice to internalize it you might feel like you have taken a step back. Don’t worry, it is just temporary. Next week I will continue this topic and outline the few things you need to know as a blues harmonica player. You will see that it is not all that much and not very complicated. I will also tell you more about the benfits of knowing a little bit of music theory. Sign up below so that you don’t miss when that article comes out!